I grew up on the Upper Niagara River, spending my formative years as a ‘river rat’, not in awe, but in fear of the mighty Cataract, seeing it a threat to my river escapades. More than once, me and my fellow rats barely escaped the fast current while tubing down the river or fishing in a rubber raft. The Falls was not to be marveled but was to be avoided. That changed the first time I went into the gorge and “discovered” a new river. There, like Saul on the road to Damascus, I was in wonder of the river and consumed by the mystery of it. I seen there were actually two Niagaras, the “Upper” and the “Lower”; as different as night from day. One -an open spigot, empting out the ‘Great Lakes’ in a roar and thunder, the other -a life-force, craving across the earth, leaving a trail of beauty and attitude. Born in Buffalo, it was after returning from duty in Southeast Asia that my enchantment was expanded by exploring and inhaling the joy of the gorge. Much has been written about Niagara, most on the ‘Falls’, little on the Gorge. Truly amazing, when one considers the extensive and exciting history that engulfs the lower river.My heart remains in the gorge, watching - listening to the "water". It's 1962, and five friends (narrator Kevin, Chuck, Billy, Wayne, and Lennie) have grown up along the Niagara River and famous Niagara Falls. They are fascinated with the history of Niagara Falls and discuss its legendary past. The boys know of its famous bridges: the railroad bridges important long ago when African-American slaves escaped to freedom in Canada, and the ice bridges, once popular with tourists and merchants alike. So, boys being boys, the five friends decide to climb down the dangerous sides of Niagara Falls to where the ice bridges, now declared off limits by law, are located. Bridges: A Tale of Niagara is an exceptionally appealing novel. 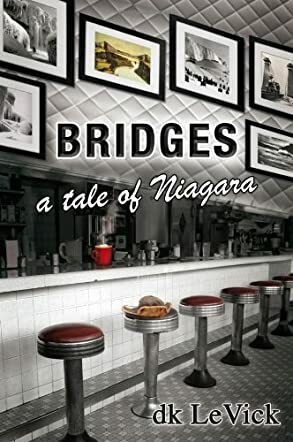 It is well written and well edited, and the reader will be drawn into the different tales told within the book's storyline of Niagara Fall's history throughout the years. The author creates great suspense as he brings this story to its conclusion in 1987. The section where African-American Chuck discusses his ancestry and leads into the story of his ancestor's escape to freedom through Niagara is absolutely riveting. The dialogue between characters is excellent and gives the story great believability. The only part that needs more work is Kevin's father, a man filled with hate for all, yet descended from a abolitionist of great strength. Readers like to know their characters and Ken, Kevin's father, needs fleshing out. The accompanying photographs and illustrations add greatly to the text, as does the general layout with short, to-the-point chapters. The author knows his subject well, and this book shines with his knowledge. All in all, this is a book worth reading by many.